Well, the iPhone 7 announcement is now officially behind us, and with all the huff and puff around the new models easing down, it's back to business as usual. And you know what that means — Monday is new apps day! Of course, each week, there are hundreds of new apps being poured over the App Store and Play Store, but we comb through them and come up with whatever catches our eye. This week, we have a very feature-rich chat app, which is still in beta, a GIF app that lets you embed sound in your animations, a couple more apps for iOS musicians, Samsung's new JifiCal voice assistant, and lots more. Check them out below, let us know which ones you liked, and if you have a great new app on your mind, which we missed, do post a link in the comments! Odio is a simple concept, which can provide fun results. It lets you craft a GIF with your phone's camera, then attach any sound from your library to it and even add a colored filter for some shine. The rest is up to your creativity. Guru Transfer is a service, which lets you send large files (up to 1 GB if you don't register) to friends and contacts. You upload it to a server and your recipients get an email with the link — that's it. Amity is an all-in-one, powerful messenger with live emoji, virtual high-fives, photo-sharing and photo requests, built-in photo filters, cards, and many more. If a feature is on any other messenger, it's a good bet that Amity has it, too. Unplanned is an event planner on steroids. You can attach your event to a specific category, invite anyone from your contacts (those without the app will get an invitation via SMS) and follow RSVPs. Your contacts can also be divided in customizable categories, so you don't end up inviting your aunt to that rave party. No, this is not an app for weight-loss per se. Instead, it's an app that will allow you to follow which foods affect your emotional state, and in what way. Granted, this does require a lot of will-power, but, in time, you should be able to get clear stats on which foods are actually your own happy foods. Hooray for getting to know yourself, right? 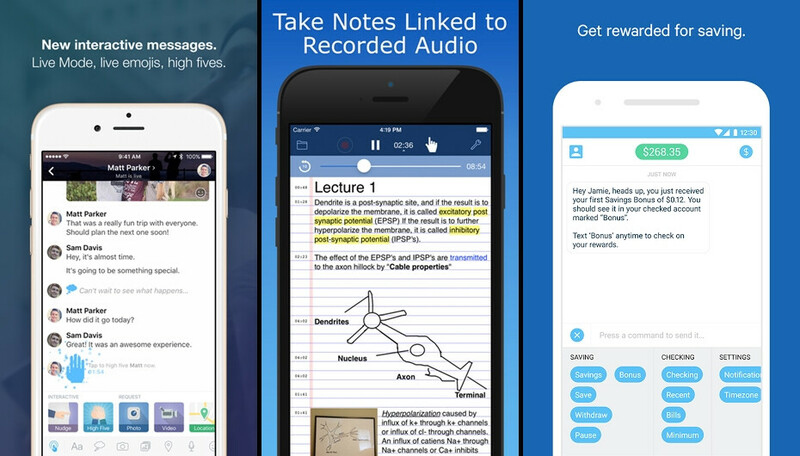 This is a note app on steroids — it lets you write down notes, highlight text in many various ways, draw or write by hand, and record audio, and more, all without leaving the note's page. 10 Ways is a social game type of app, designed specifically for those who struggle with communication for one reason or another — from a psychological issue to just not having been properly socialized as a child. Most of its mini-games are based on social games that already exist in the world, so it can be enjoyed by anyone who participates. A good game to play in a group of people. For the iOS musicians — this is a sampler, which let's you use anything from pre-processed audio to samples that you capture with your iPad in real time. It lets you build your grooves and beats by drawing with your finger, which is pretty nifty — it's intuitive and can be loads of fun. A new app by Samsung that can take voice commands specifically for event creation and calendar sync. It can understand complex commands like "I will be having dinner with mom every Sunday at 18:00" or "I will be going out with John next Friday evening". Give it a spin, Samsung people! This is a wallpaper gallery app with more than 240 wallpapers, with others being uploaded constantly, all placed in separate categories. Same principle as the previous apps — we've got more than 55 high-quality wallpapers here, constantly updated with more. This app focuses on the positive news around the world, hand-picked and curated on your phone. It's got an upvote functionality, which further allows the community to push interesting articles to the top. The app itself is full of useful features, such as night mode, offline mode, quick view, and others. One Weather is a simple, Material Design-ish, elegant app for weather forecasts. This one adds to the portfolio of turn-your-picture-into-a-painting, Prisma-like apps. If you enjoy those, you might want to play with an extra set of filters, offered here. Digit syncs up to your checking account and will, every once in a while, analyze your spending habits, then set aside a sum of money, which it believes you won't miss, into a virtual "piggy bank" of sorts. The idea is to automate your savings for you. Google Allo...that's the only new app I'm wanting to use.